Goals from Elisha Golbe and Emeka Umeh against Rivers United FC ensured that the NPFL defending champions gained the maximum point possible in two games. Plateau United who prior to the beginning of the season signed a striking sensation(Tosin Omoyele) from OSUN United to beef up their attack are hoping to defend their title in the 2018 season. In another game, the Gbenga Ogunbote led Rangers International of Enugu suffered yet another set back by loosing at home to Lobi stars of Makurdi. This is coming after losing away to Akwa United in Uyo in a match day one encounter. The Enugu based team have a lot of expectations on them as they were recently promised a bonus of one million naira for every win and an ultra modern camp was just commissioned for the team. Gbenga Ogunbote was the immediate past handler of Enyimba FC of Aba. 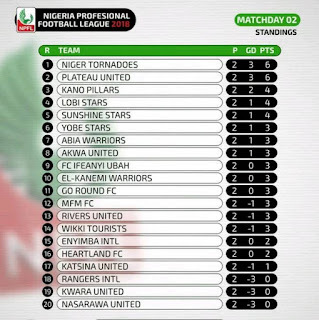 Go Round FC got their first ever victory in the NPFL against their Niger Delta neighbour, Akwa United while FC Ifeanyi Uba high profile signing Godwin Obaje's single strike was not enough to save them against Niger Tornadoes. As it is on match day two, Niger Tornadoes of Minna are leading the table with goal difference while Nasarawa United of Lafia are the last in the park.